This little martini is delightfully complex. Amante Anejo with burnt butterscotch and white pepper notes ignites a notable fire. Rhubarb shares the spotlight with Zucca Amaro highlighting its bitter dark side while Aperol illuminates the once red stalks adding cheerful, tangy tangerine to the mix. Blood Orange and raspberry shrub acts as the conductor that finds balance in a quite sophisticated cocktail symphony. Combine all ingredients in a beaker with ice. Stir well. Fine strain into a chilled coupe glass. 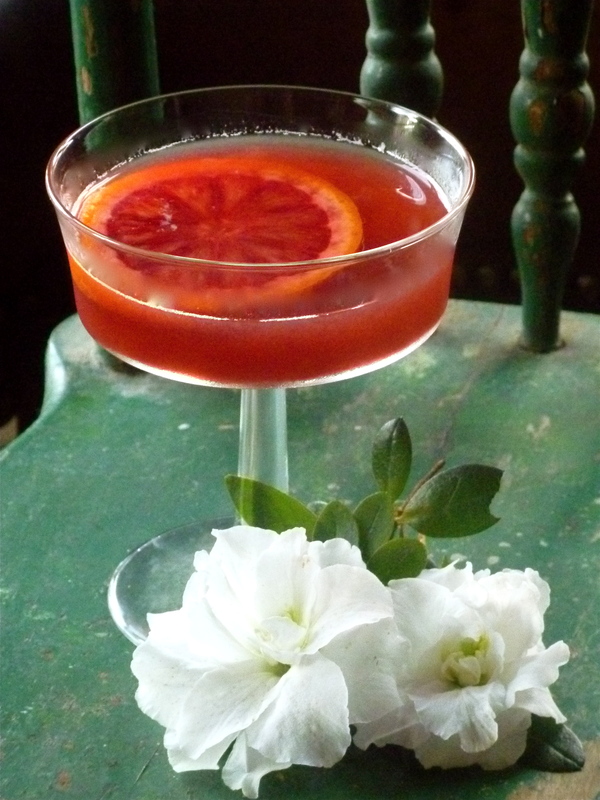 Garnish with a blood orange slice. Wash the outside of each blood orange carefully. Cut blood oranges into one inch pieces. Combine blood oranges, raspberries, sugar and agave in a bowl. Stir all ingredients lightly muddling berries. Place bowl in the refrigerator. Let sit for 48 hours – making sure to stir three or four times a day. Fine strain out all fruit. Add vinegar. Stir. Fine strain again into an airtight container.